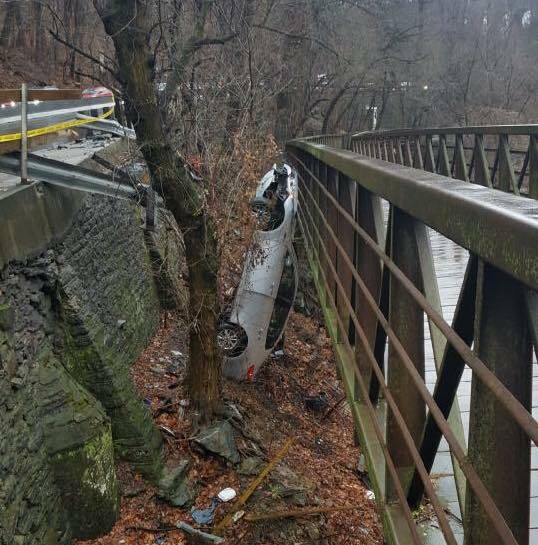 A horrendous crash on Lincoln Drive last weekend closed the Wissahickon Trail—but it is been inspected by the city, and has been reopened. Last weekend, the driver of a motor vehicle crashed through the guardrail at a curve on Lincoln Drive, sending their car off a cliff and slamming into a bike/ped bridge on the trail. We’ve been told the driver of the vehicle is OK. But since the driver’s car hit the bridge, city engineers had to go out to assess the damage and make sure it’s still safe to use. The Streets Department told us on Tuesday afternoon that the bridge was inspected, is safe, and has been reopened. This comes as a relief to the many Philadelphians who use the trail for commuting and recreational uses throughout the year, and the Friends of the Wissahickon. “FOW strongly supports swift action from the City of Philadelphia to ensure the continued use of this key segment of the Circuit Trails for commuter and recreational traffic,” the organization told us early Tuesday. And yeah, the bridge reopening is great. But there’s also the issue of Lincoln Drive itself. The City and PennDOT are in the midst of a $12.1 million project to help maintain Lincoln Drive. Some of those changes include new barriers in the median, a short side path, and resurfacing. Unfortunately, as we wrote last year, these improvements aren’t going to be enough to stop incidents like the person in their motor vehicle that crashes through a guardrail and spills into the woods. Lincoln Drive, before the resurfacing project, was in bad shape, full of potholes. And while that wasn’t ideal, tt’s likely people were driving slower along the Drive, which is well-known for speeds high above the 25 mile per hour speed limit, to avoid the bad surface conditions. As a Northwest Philadelphia resident, I regularly notice people racing at highway speeds, at least double the limit. And now that Lincoln has been repaved, drivers may begin feeling more comfortable driving even faster than they’d been over the last few years. Nothing is being done on Lincoln Drive to deal with the speeding issue. Speed cameras are still illegal on this street, and local police are not legally allowed to use radar to catch those drivers speeding through Northwest Philadelphia. Additionally, while some improvements were proposed last year for the northern section of Lincoln Drive, which goes through a residential neighborhood, many of those improvements were rejected by neighborhood residents due to the potential loss of parking on the shoulder. Unfortunately, one more example of lack of traffic enforcement in Philadelphia. What will it take? Apparently you didn’t read the article. It is likely the posted limit is set well below the safest 85th percentile speed level which would reduce crash risks and get high (85%) voluntary compliance. Mr. Walker, have you ever driven on this particular stretch of Lincoln Drive? Have you driven Lincoln Drive? If no, then your response is without merit. I use to drive Lincoln Drive to/from Jenkintown daily. I avoid it when I can due to how curvy and narrow it is from City Avenue to the neighborhood. Plus, Philadelphia Area Drivers rarely drive in response to the conditions of the road, let alone the design of the road and where it cuts through. PAD’s also like to ride bumpers at high speeds as well as during terrible weather conditions. The 85th Percentile only works on highways/freeways or other similar road designs. The speed limit for residential roads cannot be set based on your blanket response. It is simply reckless and irresponsible. The road/lane designs should be reassessed based on what we now know about the conditions surrounding certain crashes (a high number in a small area/same location). Example: The initial southbound stretch of Lincoln Drive should be a single lane until it reaches the wide straightaway where you can get off at City Ave, go straight to Kelly Drive, or get off at Ridge Ave.
-I’ll respond to comment replies as I find time. Where did the red Dodge Caravan (or similar) minivan come from, or has that been sitting down there at the creekside for years? Sorry, but is this the Bicycle Coalition blog or the AAA blog? It’s both disappointing and dismaying that the focus of this article shifts from the Wissahickon Bikeway to Lincoln Drive and its’ motor vehicle traffic issues. There was no mention of or concern about (or, even worse, awareness of?) the dangerous conditions facing cyclists, and other trail users, on both the Wissahickon Bikeway and the adjacent Forbidden Drive. In many places, the bikeway has been covered with leaves, gravel, mud, and water (now turning to ice). While Philly Parks & Rec apparently does virtually no maintenance on the bikeway (other than to remove large fallen trees), there was money to install new signage at the Ridge Avenue trail head that renamed it “Lincoln Drive Trail”. Really? How insulting! There is even a new sign for the Circuit – welcome to another neglected trail! Unbelievably, 2/10ths of a mile below the jeopardized bike/ped bridge, where the bikeway is mere inches from Lincoln Drive, there has been no guard rail! Meanwhile, Forbidden Drive is a pothole-ridden mess, also covered with rotting leaves, gravel, and mud. Is that to slow down speeding cyclists by design? 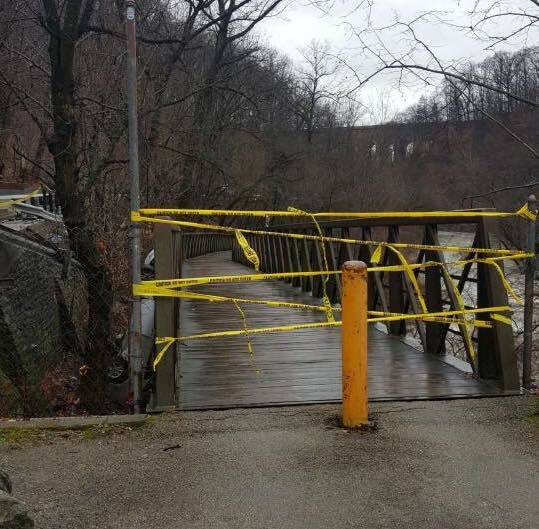 Shouldn’t the Bicycle Coalition be focusing on bicycling issues and FOW/Parks & Rec be repairing and properly maintaining the Wissahickon Bikeway and Forbidden Drive, the 2018 Pennsylvania Trail of the Year? Hi ChuckWagon: As you know from reading this blog, the poorly designed roadway alongside the trail had a direct effect on the trail. It was closed for days because a car crashed into it! Because of this poor design, we will likely continue to see more dangerous driving which has a direct effect on the trail. Last week, I was riding along the trail and came across a minivan which crashed through the guide rail and fell below the bridge. Cyclists lives are directly affected by the poor road design. As far as maintenance of the trail goes, I ride the trail to and from work several days a week and think it’s in pretty decent shape. If you see something you think needs work, though, you should contact Parks and Rec and 311. I have done that several times in the past to get the trail plowed and salted, and they’ve been responsive. You think the trail is “in pretty decent shape”? That is due to the efforts of 1 person, not a member of FOW either I believe. P&R does nothing. I reported the gravel slide into the path at the bridge to Lincoln Dr. to 31 in May and nothing was done. Leaves built up so badly this fall tha I. Slipped sideways at least 6 times and went off the trail trying to recover twice. I watch 2 individuals fall due to wet leaves an not being able to even see the path. The only reason this path is safe at all is due to this one individual who has asked to remain nameless. As to the Lincoln Drive issues, I live in Mt. Airy and deal with the crazy drivers almost everyday. Most of these… people, I refuse to call them drivers, are mostly a danger to themselves, except on the turn in question. It’s only a matter of time before there is a trail user on the bridge when one of thes crashes happens. Unfortunately this is a matter that is NOT the priority here.